(Nanowerk News) Researchers at Oregon State University have made a significant advance in the use of photodynamic therapy to combat ovarian cancer in laboratory animals, using a combination of techniques that achieved complete cancer cell elimination with no regrowth of tumors. The findings were just published in the journal Nanomedicine: Nanotechnology, Biology and Medicine, and after further research may offer a novel mechanism to address this aggressive and often fatal cancer that kills 14,000 women in the United States each year. Ovarian cancer has a high mortality rate because it often has metastasized into the abdominal cavity before it’s discovered. Toxicity and cancer-cell resistance can also compromise the effectiveness of radiation and chemotherapy that’s often used as a follow-up to surgery. The new approach being developed by researchers from the OSU College of Pharmacy and the University of Nebraska takes existing approaches to photodynamic therapy and makes them significantly more effective by adding compounds that make cancer cells vulnerable to reactive oxygen species, and also reducing the natural defenses of those cells. “Surgery and chemotherapy are the traditional approaches to ovarian cancer, but it’s very difficult to identify all of the places where a tumor has spread, and in some cases almost impossible to remove all of them,” said Oleh Taratula, an assistant professor in the Oregon State University/Oregon Health & Science University College of Pharmacy. Using the new approach, a patient is first given a photosensitizing compound called phthalocyanine, which produces reactive oxygen species that can kill cells when they are exposed to near-infrared light. In addition, a gene therapy is administered that lowers the cellular defense against reactive oxygen species. Both the phthalocyanine and genetic therapy, composed of “small, interfering RNA,” are attached to what researchers call “dendrimer-based nanoplatforms,” a nanotechnology approach developed by OSU researchers. It delivers the compounds selectively into cancer cells, but not healthy cells. Compared to existing photodynamic therapies, this approach allows the near-infrared light to penetrate much deeper into abdominal tissues, and dramatically increases the effectiveness of the procedure in killing cancer cells. 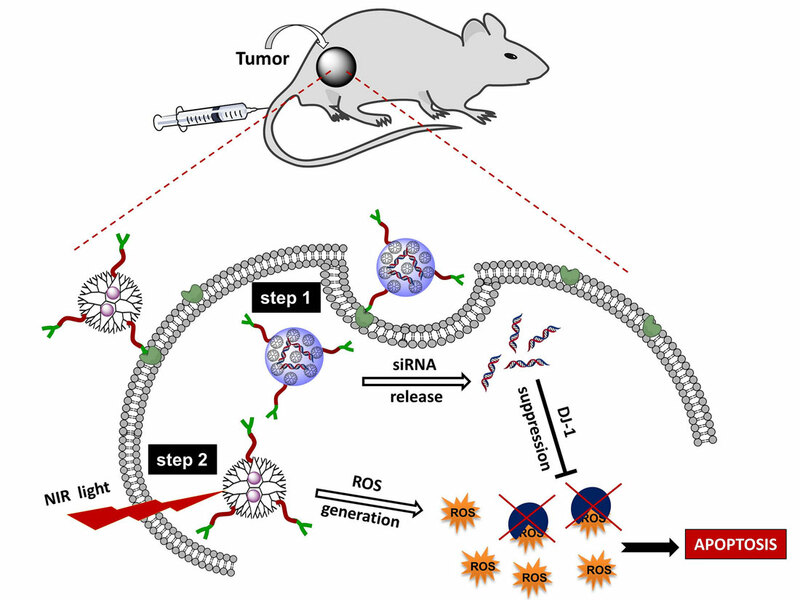 Using photodynamic therapy alone, some tumors in laboratory animals began to regrow after two weeks. But with the addition of the combinatorial genetic therapy to weaken the cancer cell defenses, there was no evidence of cancer recurrence. During the procedures, mice receiving the gene therapy also continued to grow and gain weight, indicating a lack of side effects. The overexpression of DJ1, researchers said in their study, is associated with invasion, metastasis, resistance to cancer therapies, and overall cancer cell survival. That excess of DJ1 is silenced by the genetic therapy composed of siRNA. The findings of this research, Taratula said, could also build upon some other recent advances in photodynamic therapy, in which a different compound called naphthalocyanine could be administered prior to surgery, causing the cancer cells to “glow” and fluoresce when exposed to near-infrared light. This provides a literal road map for surgeons to follow, showing which tissue is cancerous and which is not. There’s no reason that approach couldn’t be combined with the newest advance, Taratula said, providing multiple mechanisms to improve surgical success and, with minimal side effects, help eradicate any remaining cancer cells that were not completely removed.